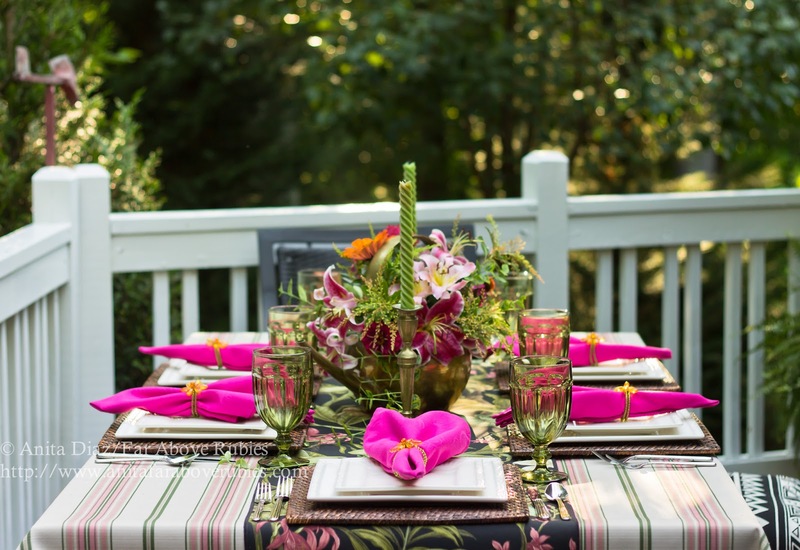 I love any excuse to set a pretty table, so when the folks at Mikasa agreed to send me the square Italian Countryside dinnerware, I knew it would be fabulous outside on the porch. 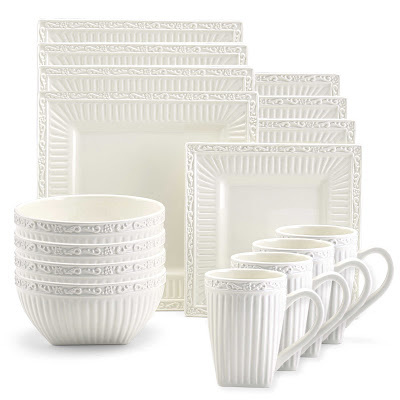 I am in LOVE with square dinnerware and have been since Mikasa sent me the Brava Rooster dinnerware six years ago. 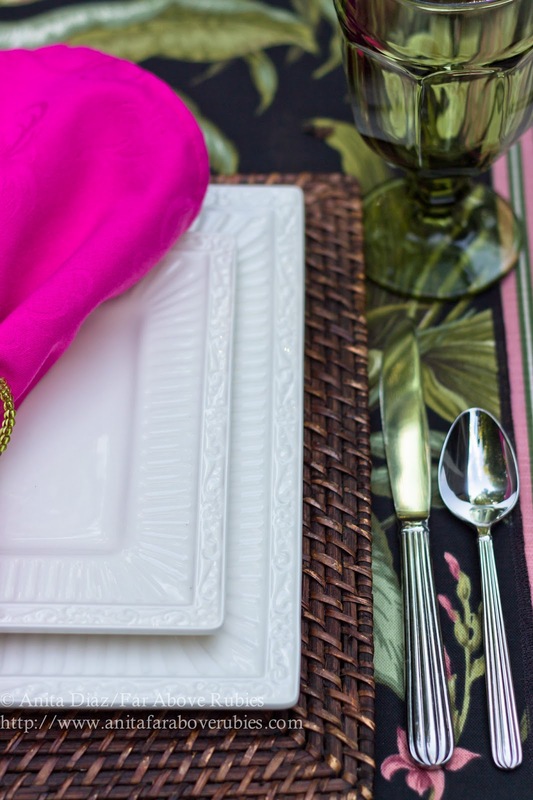 As much as I love pattern and color, I am a big fan of white dinnerware that can be mixed and matched with different colors and patterns, so the creamy Italian Countryside is perfect. 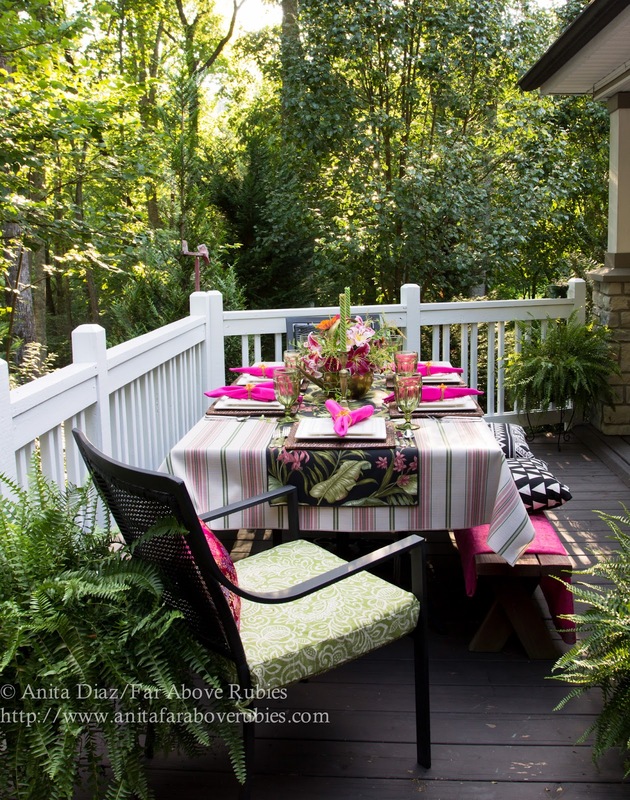 For this particular table, I wanted to use the porch where I have, as with the other outdoor spaces, added hot pinks, greens and black. 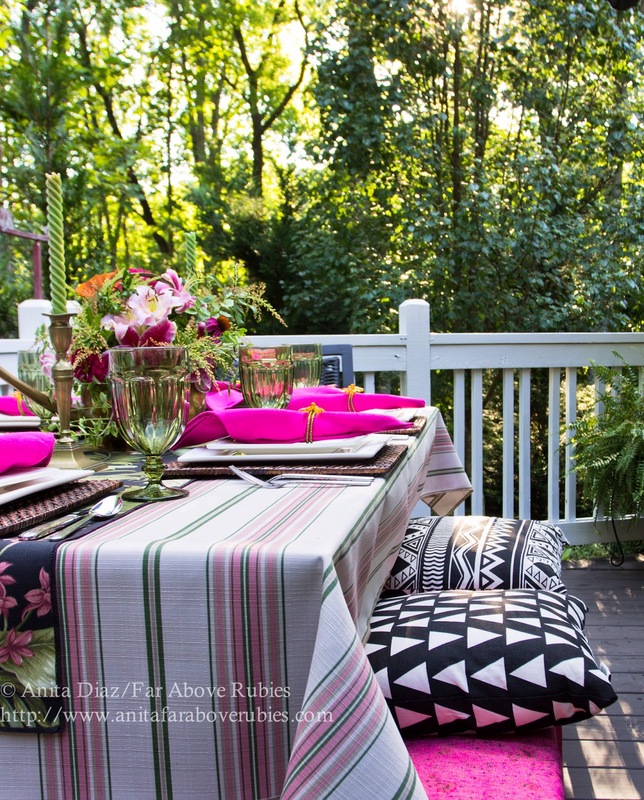 I am using striped outdoor fabric as a tablecloth, and a runner made from the Waverly Wailea Coast Ebony. I love that I can leave this out and not worry about rain, etc. I used the rattan square chargers for added natural texture, and am happy to have another set of square plates to use them with as they set off this pattern beautifully. The folks at Mikasa sent me four place settings, including cups and bowls, which I'll use in another setting. I bought four more place settings at Mikasa and paired them with the Italian Countryside flatware, April Cornell napkin rings and iced tea glasses from Walmart. I like the large, chunky glass with the larger plates. The napkins were eBay finds, and I snapped up 12 so I have plenty. 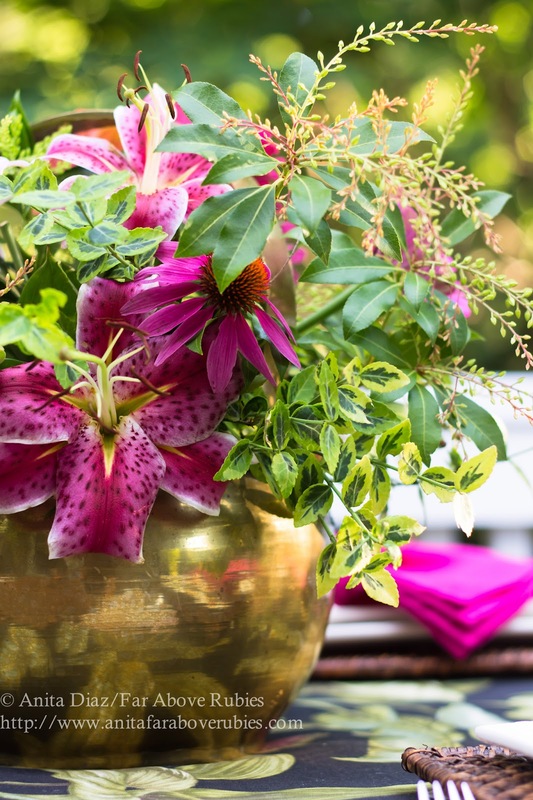 For a centerpiece, I tied all the colors together with blooms from my mother's garden, which I placed in an inherited brass pot from India. I draped a sari over the bench, then placed the pillows I got at Ross last week (2 for $15) to make the benches more comfortable. Inherited brass candlesticks with vintage twist candles will provide a soft glow as the afternoon turns into evening. 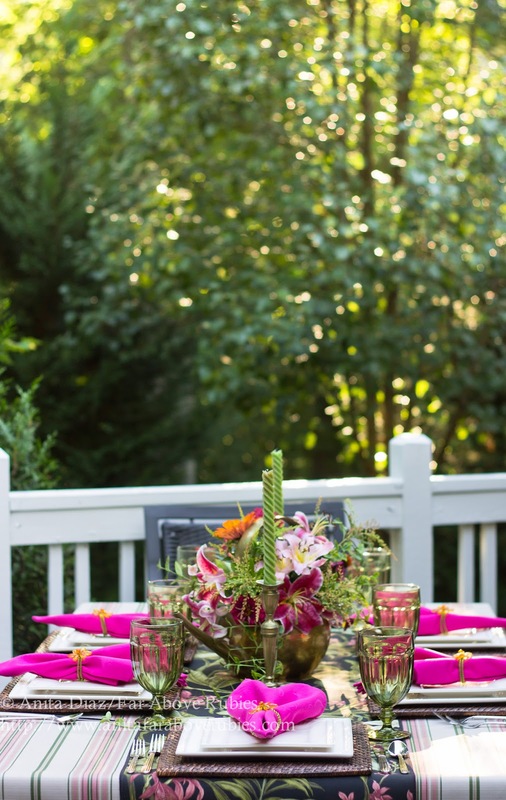 I love this colorful table and am enjoying using this square pattern so much. It adds a contemporary flair and makes this table so much more interesting than round plates would. So here are the specs on the pattern. You all know how much I love my Italian Countryside dinnerware as I use it a lot. I love the square pattern as well, but you need to know it is stoneware, not porcelain like the round pattern. So, it's heavier and will chip more easily. I do love that I can mix and match all these pieces, and can't wait to show you the cups and bowls. Mikasa has great deals on their website, plus if you are a first-time customer, you can get 20% off. They also have up to 75% off of some sets, which is a great deal. Definitely check out the site, and I certainly recommend adding the square pattern to your collection, which will give you lots of mix and match options. The Mikasa Italian Countryside dinnerware and flatware were provided by Mikasa. All opinions are my own. Anita, your setting is beautiful! I love the square plates! I have the round pattern; but, I would love to add these to my collection. 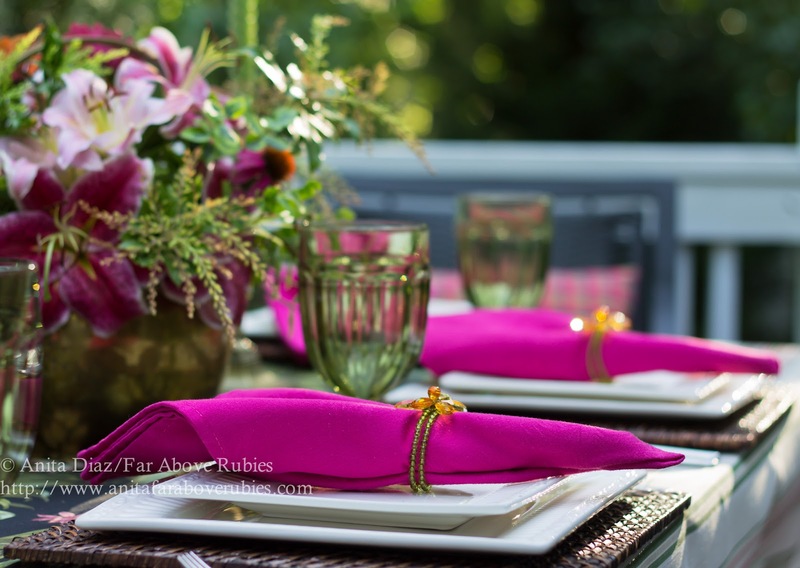 You always have such pretty tablescapes! Thanks Shenita!! I sure love the round ones and never get tired of them:-) Definitely add the square! Gorgeous. 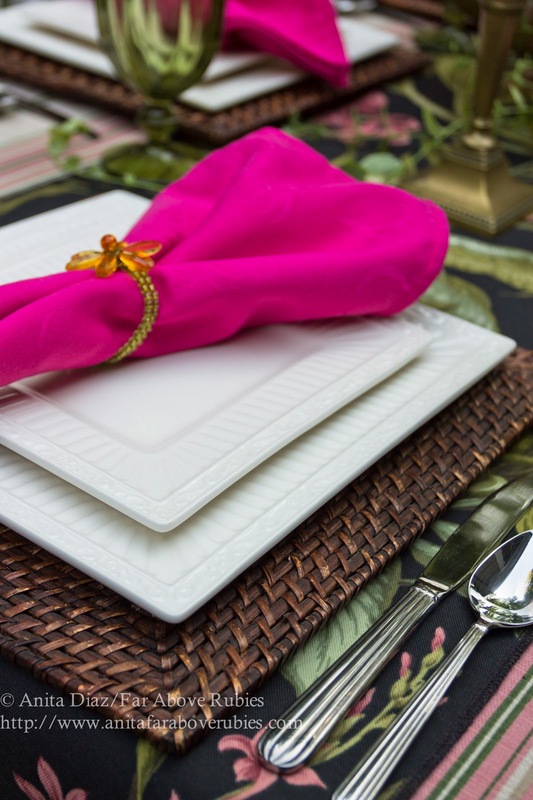 I love that dinnerware set, so pretty and your tablescape is stunning. I might just want those dishes!! I have had a set of Mikasa Country Berries since 2000. We use them every single day and they are wonderful because they don't break or chip easily. I'd love to get the solid white square plates. Fun!! Love the way you set everything up, as always, That pink makes me swoon. Winter frost Correll settings is what I'm after:). I've had stoneware and the chipping occurs with my family. 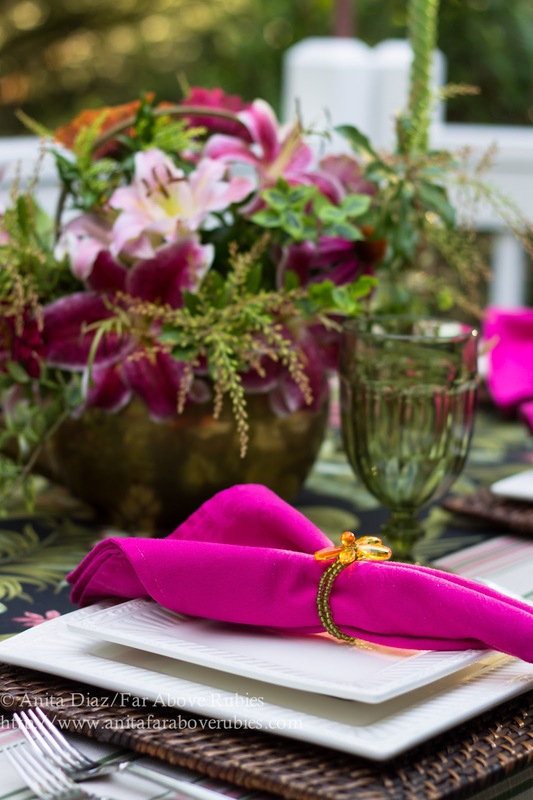 A beautiful colorful tablescape is one of your many talents. I appricate old ( have a few ) and new dishware, if only viewing them in blogland. So beautiful and creative, Anita! 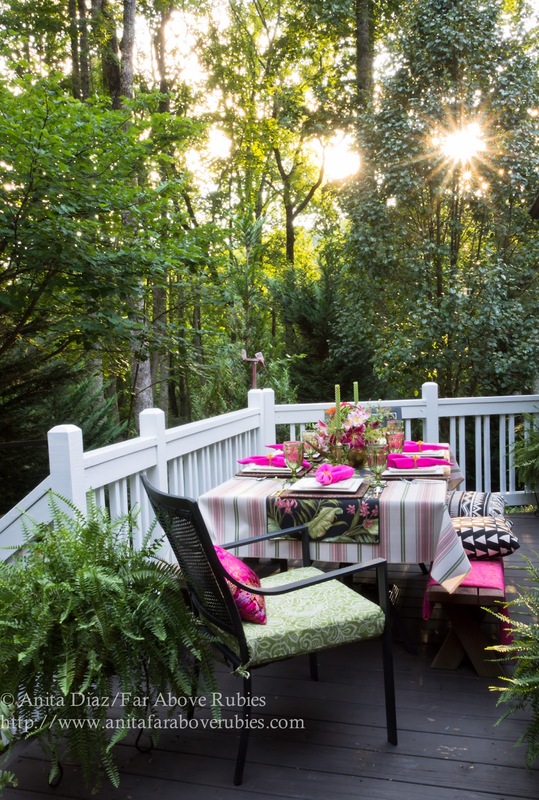 I would love to sit in such a place and enjoy a meal. Your photos are beautiful, too. Did you use your 50mm lens for these? Thanks! Thanks Andrea:-) I used the 50mm for closeups and the 17-40mm for the others. Anita, I agree, the square plates are so interesting. I like to even mix them with round plates on occasion. Your colors are gorgeous. Beautiful table! 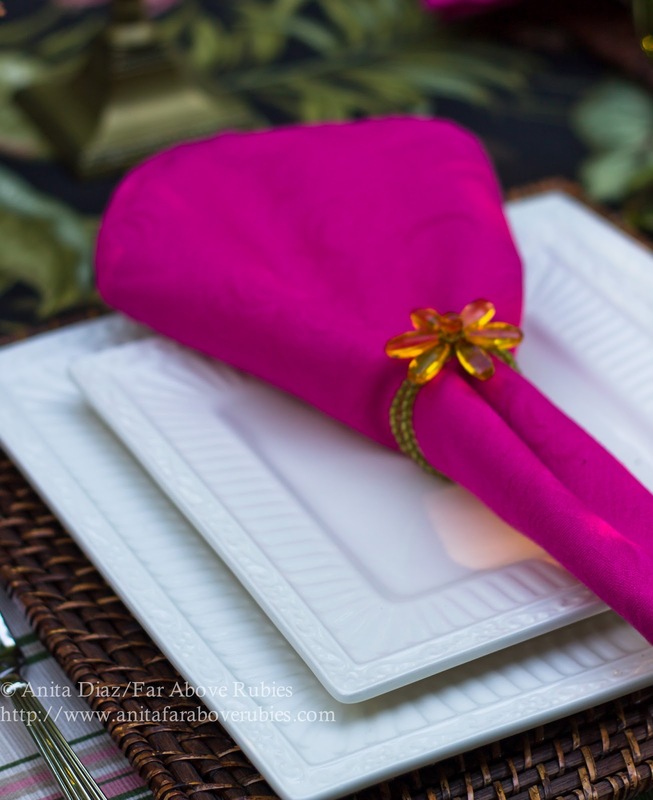 This table setting is beautiful, Anita! 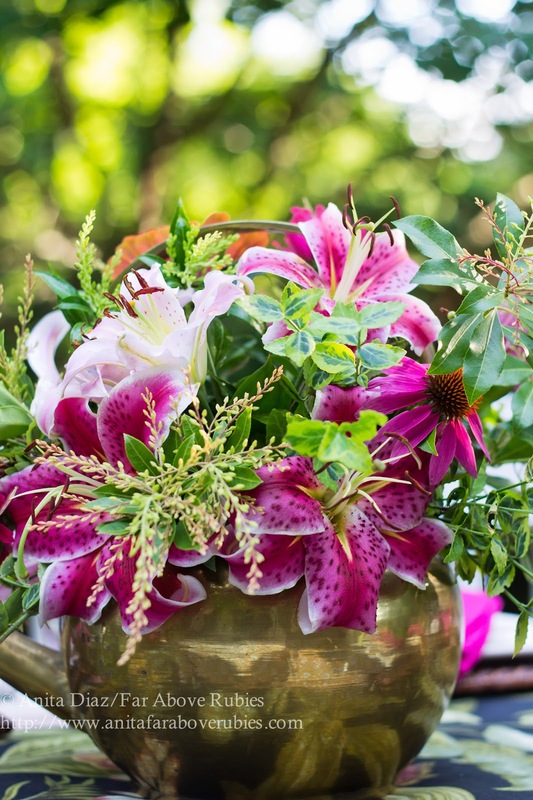 I love all the bright pinks in your decor and your gorgeous flower arrangement. I don't have any Mikasa china at all; wow -- I really need to get some. ;) These dishes are lovely. My mother-in-law has the Mikasa French Countryside, which is also pretty. Since I love all things English, I might need to look at the English Countryside pieces. Your porch looks so peaceful and relaxing and your photographs are great. Have a good week! 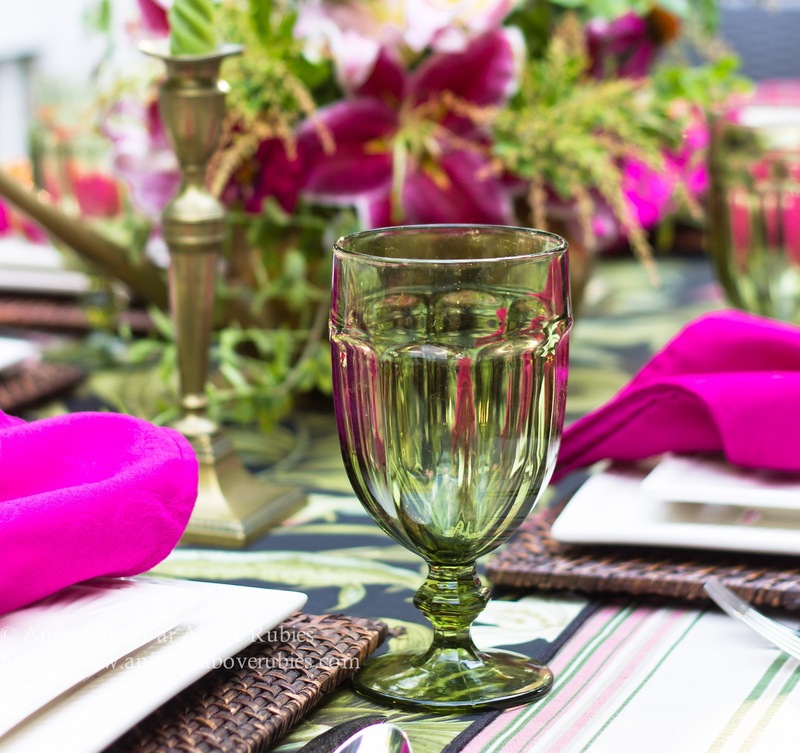 Oh my..the Mikasa is so beautiful....and you made it look more beautiful with that amazing tablescape....and of course that outdoor setting is always breathtaking! Hi Anita! 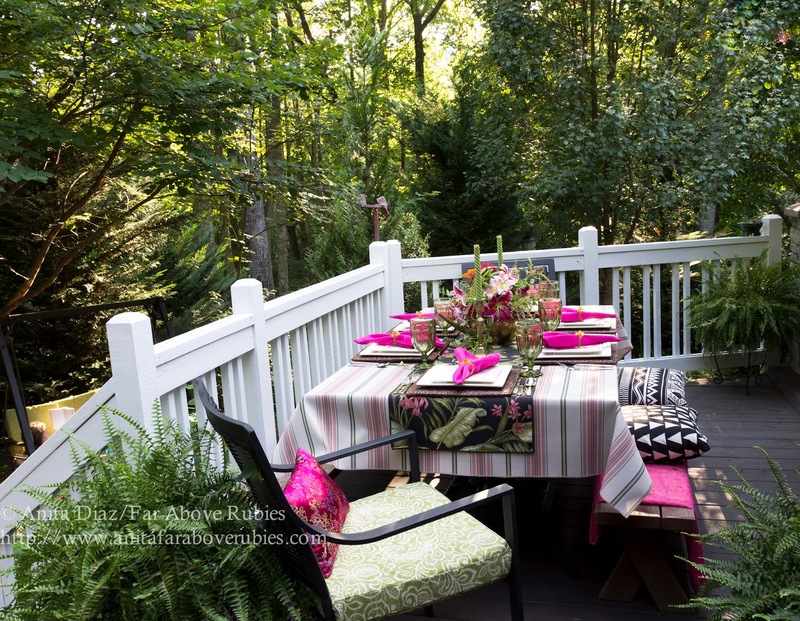 This is such a lovely setting....from the deck to the trees in the background, to the tablecloth, dishes and napkins....just wow!! Beautiful colors & textures all together. Well done! It is all beautiful but those napkins, Wow wow wow. They just pull it all together. Just lovely. The colours are terrific and I am always a fan of white dishes. Oh I adore how you paired the pops of color with the brass. Perfection! Have a wonderful week my friend.